^ a b c d e f "Speedway History". Charlotte Motor Speedway. Archived from the original on January 15, 2012. Retrieved November 12, 2015. 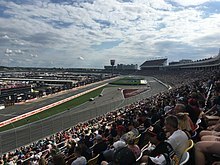 ^ "Charlotte Motor Speedway and Panasonic Announce World's Largest HD Video Board". September 22, 2010. Archived from the original on September 24, 2010. Retrieved September 22, 2010. ^ News, A. B. C. "ABC Sports News". ABC News. Retrieved January 2, 2019. ^ "SRLY". SRLY. Retrieved January 2, 2019. ^ Albert, Zack (January 22, 2018). 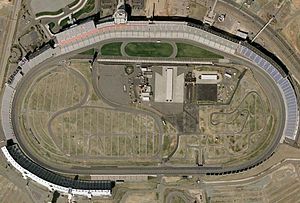 "Charlotte Motor Speedway introduces final road-course layout". nascar.com. NASCAR. Retrieved September 30, 2018. ^ a b "Lots of love (and $80M) keeps track in Concord". nascar.com. November 27, 2007. Retrieved April 29, 2010. ^ a b Poole, David; Durhams, Sharif (October 3, 2007). "My way or no speedway, Bruton Smith tells city officials". The Charlotte Observer. ^ "zMAX Dragway – A Year in Review". Charlottemotorspeedway.com. Archived from the original on July 23, 2011. Retrieved November 25, 2010. ^ "zMAX Dragway @ Concord Fast Facts". zmax.com. Archived from the original on July 18, 2011. Retrieved November 25, 2010. ^ "Dirt Track". Charlotte Motor Speedway. Archived from the original on April 14, 2013. Retrieved July 18, 2013. ^ "Historical Motorsports Stories: Football at Charlotte Motor Speedway - Racing-Reference.info". racing-reference.info. Retrieved February 4, 2018. 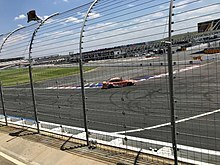 ^ "Race Results at Charlotte Motor Speedway". Racingreference.info. Retrieved November 25, 2010.